Reinforced urethane finish layer for protection against scratches, scuffs, stains and wear. Heavy-duty clear and embossed wear layer prevents rips, tears, gouges and indentations. Print film for beautiful, realistic wood or tile designs. 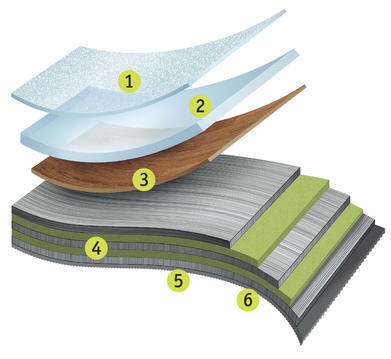 Fibercore™ stability layers fiberglass mesh and cross directional layers prevent gaps and keep the floor lying flat. Factory applied re-positionable adhesive for faster installation. SureSet Technology allows for simple, fast installation and stands up to high traffic areas, absorbs sound and can be installed in areas with high moisture. The unique sculpted wave backing system makes the product flexible, pre-applied adhesive for quicker installation and re-positional for easy installation experience. SureSetTM Technology is a waterproof* solution that allow you to use your space immediately after installation and can be installed in all areas within you home. Transcend SureSet is protected by a Tritonite®-reinforced urethane finish layer for protection against scratches, scuffs, stains and wear.